Just curious but why did you post this? Academy chapel to add outdoor circle to worship areas. At the Air Force Academy, it's all about respect. Thanks Thy Peace, I corrected the link. There might be a lot of upset that they're spending our money (which it isn't, really .. it's the government's money that the government took away from you and me) to build this stuff, but they also built the chapel out there. The most distressing thing, I suppose, is that there will be folks who are attending at that "Stonehenge of the Rockies", who actually think they're better off for it, and our government helped facilitate that. Come on people,if a person is going to spend eternity with Satan, the least we can let them do is worship him now. "The most distressing thing, I suppose, is that there will be folks who are attending at that "Stonehenge of the Rockies", who actually think they're better off for it, and our government helped facilitate that." The government facilitating something that makes people feel like they are better off is something the government needs to look into doing a lot more often. "Come on people,if a person is going to spend eternity with Satan, the least we can let them do is worship him now." How is it that some Christians can be so smug and stick their nose in the air to anyone who they believe is going to spend eternity with Satan... How about some humility and a little bit of "Judge not, lest ye be judged..."
Wiccans are a fairly established group, and it appears that many want to serve in the Air Force. If there are to be any places of worship provided by the Academy, then this is a good step. From what you wrote, would you agree that Wiccans and 'witches' believe that the preaching of the Gospel is inherently negative ? Would we really prefer that our government prevented the free exercise of religion by not providing a place of worship to these people (however misguided their beliefs are)? We don't think twice about salaried chaplains or building used for churches. And this is not so far from the vision of the founding fathers as might be assumed. What with founding Baptists being for the free exercise of religion even for "turks" and "atheists." What with many founders being Masons whose pagan symbolism is well documented. Either we believe in freedom of religion or we don't. It really is that simple. As a Baptist, I tend to be for it. Well, at least them boys get to smoke in church! I am not for certain, but the two people of whom I know are Wiccan would likely believe and support the right of each person to worship when and whomever they choose. I hardly think Christianity has anything to fear from Wiccans, if anything, knowing who they are might help us be a better witness. My experience is that this group is fairly quiet and reserved, keeping to themselves in their practice. Though maybe some could argue that is indeed their danger. Sort of like the 2nd generation ICP craze sweeping our youth today. I certainly disagree with both the beliefs and practice of wiccans (or witchcraft, whatever is the correct term for it). I agree that such a "religion" being practiced is by cadet military officers of the United States is. . . a shame? A disgrace? A sad commentary on the US? Or on the failure of Christianity to reach a lost and dying generation? Whatever, put in you favorite negative connotation and I will probably agree. But I am not sure I can disagree with government funds being expended for the "construction" of the place of worship. For one thing, I agree with Chris Ryan and John Leland. For another, the entire rationale behind the government having and paying for chaplains is that those whom they serve--be it in the military, or in prison--is that it would constructively constitute a denial of their constitutional rights to be able to worship as they saw fit if the government did not provide. After all, neither inmates in a prison nor military service personnal can stroll down to the church of their choice at will, as the rest of us can. And the only way the military can be unbiased and not promote or ESTABLISH one religion over another is to make all available. Maybe this news should make us more diligent to present the Gospel. The story begins with the history of WHY the academy had to take actions to protect the religious freedom of its cadets. "Morton and Leslie reported that the Yale team "observed consistent specific articulations of Evangelical Christian themes." The memo further explained how one chaplain encouraged cadets to proselytize fellow cadets, reminding them that those not "born again will burn in the fires of hell." This declaration came from Major Warren "Chappy" Watties, a full-time chaplain at the Academy who at that time was the U.S. Air Force's "Chaplain of the Year." The memo concluded: "YPT clearly articulated a concern that such stridently Evangelical themes challenged the necessarily pluralistic environment of BCT (basic cadet training). YPT (Yale investigators) expressed a concern that the overwhelmingly Evangelical tone of general protestant worship encouraged religious divisions rather than fostering understanding among Basic Cadets." Sounds like young cadets of all faiths were forcibly exposed an extremely strident form of 'christian' fundamentalism. Question is this: the people responsible for this harassment KNEW they were setting up for confrontation. They did create divisions AND publicity. Apparently they had the backing of some people at the Pentagon to do what they did. I don't think the 'goal' was to truly turn anyone towards Christ. From my perspective, the goal of these fundamentalist extremists was something profoundly negative and against the best traditions upheld by the chaplains of the United States military. Depends on how you look at it. If you consider that most of what would become America was not Christian at the time of the Founding Fathers, this seems to pale in comparison. Also, I cannot expect non-Christians to know and worship Jesus Christ, though that's both my prayer and my hope. I believe in First Amendment rights, so if someone wants to sing a love song to Buddha in the public square, they should be free to do so. However, I would pray for Christ to save them and deliver them from the spiritual darkness they are in because only He can do that. P.S. Only thing I DON'T like are songs like "My Sweet Lord" by George Harrison which sounds Christian at first and slowly reveals its true nature and object of worship. It's one of those songs where I can't help but say, "Just get to the point already!" And I'm grateful that he had First Amendment rights to express himself, and that I have Zero Input rights to plug my ears. OH! A knock on "My Sweet Lord"? That's too bad. I think it's a genuinely spiritual song, whether your lips utter "Jesus" or "Krishna". But all the comments in support of freedom of religion and separation of church and state are quite refreshing here. It's not smugness. It's religious belief. Various religions condemn others to condemnation for not accepting the dogmas of that religion. Why cannot Christianity hold to that view as well? It's when they overstep the line, and burn people at the stake, or persecute, that it becomes unacceptable. If I believe in salvation by Christ as defined by the Christian religion from the Bible (and I do), I accept its exclusive definition of salvation in Christ alone by Grace alone through Faith alone. Salvation is not based on merit, so there is no smugness or elitism involved. Conversely, if someone from another religion wants to condemn me to hell or whatever punishment they have in that religion, that is of no concern to me, as their religious beliefs have no affect on reality one way or the other. Steven Sark, I am only knocking the religious content of the song, not the talent of the musician or the quality of the music behind it (which I actually like). The burden of proof is on those who believe in Hare Krishna to prove that the song is not just a talented expression of worship and devotion to a figment of some people's imaginations. But each to his own. WDalAustin, I meant to say "effect" not "affect" above. Steven Sark, it is a genuinely spiritual song, from the standpoint of the ability of the human spirit to worship. The ultimate object of worship in that song is the problem for me. However, if I was not a Christian, I would say the burden of proof rests on Christians to prove their Deity exists. So, if a non-Christian says I'm worshiping a figment of my own imagination, wonderful! Thank God for separation of church and state and First Amendment rights. "The ultimate object of worship in that song is the problem for me." Is the "ultimate object" a person worships spirit? - or words and mental images? If Harrison says "Rama" and "Krishna" (which are representations of the Brahman (God) in Hinduism) but has the spirit of love and an open heart - would Christ not hear this praise? Will He turn a deaf ear to those not using the "correct" sounds on their lips and without the "correct" picture and story playing in his mind while singing? Sorry I think I've been misspelling your name. That's an interesting question. All I can say is, that it did not work for the Israelites worshiping the Golden Calf, and there was plenty of love and devotion expressed there, and in God's name, too. In my belief, it's not about just having the proper emotions, or good intentions, but having an understanding and devotion based on a spiritual relationship one has with Christ. I know the cliche, "it's a relationship not a religion" is a little worn-out, so I'll borrow one I saw online, "It's against my relationship to have a religion." Good point about the golden calf story. However, I believe that the Bible is a work of man, and that the golden calf story was most likely written by a political/religious group in Judah much later who were interested in consolidating the various religious practices in Judah into the one cult of Yahweh. Is God really so jealous, or is that more of a human trait used in Scripture to describe God in order to consolidate power and promote a political/religious agenda (whether good or bad, sincere or not)? I think the latter is more likely. George Harrison probably viewed his religion as a relationship too. "My sweet Lord" is a pretty tender sounding sentiment. I see a circle of rocks covered in snow. How much could it have cost? I believe in freedom of religion. I've seen what forcing Christianity down the throats of children in the patriarchy movement has done and it's far worse than what a band of wiccans can do. I believe in freedom of (not from, but of) religion and guard my freedom carefully. I'm glad I have room to work out my salvation with fear and trembling and believe I need to give others that same room. I've had several Christian friends who used to be wiccan or atheist. I think it was good for them to have had the freedom to explore before their hearts settled into what I believe is the true faith, Christianity. 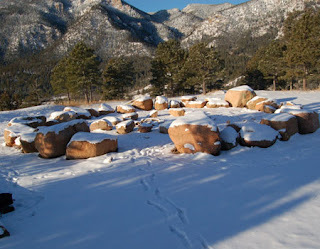 I don't feel it's my job or my right to gripe about a circle of rocks out in the snow when there is a beautiful, heated, air-conditioned, plumbed chapel (yes, I've been there. My brother is in the Air Force) there for Christians. I can be sad that people feel they can find what they need and want in the Wiccan beliefs. I can also feel sad that people have turned to those beliefs due to very real abuses within the Church. But I don't have to get self-righteous or indignant when our government sets up a circle of rocks out on the side of a mountain somewhere for people who are going to and have the right to worship as they please. I would have thought PETA would have some problems with it. Some Wiccan groups still carry out animal sacrifice at certain times of the year.
" The memo further explained how one chaplain encouraged cadets to proselytize fellow cadets, reminding them that those not "born again will burn in the fires of hell." I read that 2 street preachers were shot and killed in Fla. It was a tiny news item buried in all the fluff about Sarah's handwriting. The accommodations look very fitting for those preparing to thaw in hell. I tend to agree with Megan Austin in wondering why this post. I’m sorry for the time it took me to say so. There! How’s that for not receiving replies I think are important? In one case, a Jewish cadet was told that the Holocaust was 'revenge for the death of Jesus'. In another incident, a Jewish cadet was called a 'Christ-killer'. The perpetrators were extremist fundamentalists. There are SOME who would call these anti-Semitic individuals 'Christian', but I cannot. Incredibly, (or maybe not), this anti-Semitism followed a few years of extreme harassment of women at the Air Force Academy, wherein many complaints were filed and not acted on. Isn't it strange, that once the bullying of women was finally addressed , the bullies then turned their venom on another minority: the Jewish cadets. Whatever is at the heart of extremist fundamentalism, it is most certainly not the Lord Jesus Christ. Extremist fundamentalism in any religion, is an evil servant of Satan, in my opinion. Those not born again will burn in hell. Is that statement true or false? Instead of answering the question, you bring on a recitation of bad behavior from what you term as fundamentalists. What confuses me further is your view on salvation. An anti Semite is not a Christian but a Mormon is? How do you come to these conclusions? "We've come a long way since the days of our Founding Fathers." What do you mean exactly, Wade? Your comment seems to suggest that you are opposed to this example of religious accommodation? Or did I misread you? I realized after I posted my comment that you probably would not view that Bible reference as authoritative. But I think my reference of it still has merit. To me, the OT seems to express the absolutely exclusive monotheism of YHWH coupled with His refusal to accept any worship not conformed to His standards and expectations. I believe Christianity adopts and extends that context, even in its Trinity of three separate persons forming one divine being (No, I don't understand it, LOL). This makes sense to me: if you adopt the premises that God is a single unity and is omnipotent, omnipresent, and omniscient, then any amount of "jealousy" on His part and all efforts at true worship on our part are justified. And perhaps not all Christians would agree with me, but that is the context from which I judge religious worship and spiritual content. One more thing I want to say, and I do not mean this as a snipe. Many of the atheist sites I have visited would happily assert that my Christianity is a tender, sentimental relationship with an imaginary being which of course, is just all in my head. If they are correct, no amount of hopeful belief on my part promotes that reality to a more positive one. If I am correct, no amount of assertive disbelief on their part will dissipate the negative reality they face. Of course, you can make this comparison with almost any religion. The point is that the presence of the relationship in a person's mind does not guarantee the assumed reality. "The point is that the presence of the relationship in a person's mind does not guarantee the assumed reality." Once again I see all the stipulations of the OT concerning worship as human inventions. A group of scribes and priests who want to consolidate power in Jerusalem will probably outlaw forms of worship that do not require the temple in Jerusalem, for example. This is not to say they are lying, but rather that they have biases, human biases, like we all do -which they then rationalize. Many of them probably did think that they could speak exclusively for Yahweh. If there is an infinite God, let's hope He is not evil - which he would have to be to send people to an eternal punishment without hope of reprieve. fun discussion- thanks to all! Before you go, I believe we are interpreting the word jealousy differently. I believe by it you mean that someone feels owed something (say, worship or thankfulness or honor) that is lacking. I would rather define jealousy as a quality of God in which honor, worship, and thanksgiving are owed simply due to the quality of God's nature as unique, uncaused, eternal, and absolute. I won't go into detail explaining this, but human emotions and divine affections are two different entities in our belief system. I think if the word "jealousy" means something different, then perhaps a different word should be used. "human emotions and divine affections"
We only have access to human emotions - so doesn't it become meaningless to talk about God if we have no reference points? Hmmm. That's a great question, and I have not thought of it that way. At any rate, the only response I could give at this point is to say we only know of God what He has chosen to reveal, and that I believe this includes this area, that the Bible reveals a distinction between human emotions and divine affections as I call them. There is no way to properly understand God outside of revelation, any more than a grasshopper could hope to understand Einstein and his thoughts. However, if someone does not accept the authority of the Bible, it does no good to say, "The Bible is true because it says it is, and here's what it says about X, Y, and Z." Have to admit, though I do not agree with you, you are very interesting to converse with. Thanks for the conversation. Perhaps we can talk again on another subject, because now I'm not sure how to continue. LOL. There is nothing above that appears different from jealousy as we know it. We can say it's a divine affection, but it is indistinguishable from human emotion - not to mention that anyone living today would consider it wrong to blame grandchildren and great-grandchildren for the deeds of their ancestors. Surely these sentiments in Exodus are the product of an ancient understanding of morality that is human in origin. Of course, there are theodicies that are interesting, and I do not completely discount them, - but God is presented as a personable being who speaks in Exodus, and a jealous one at that - as we understand the term. Thank you for the quality exchange! There is nothing better than when two people, despite maintaining some disagreements, leave a conversation both the better for it. I know you have made me think ( I reexamined some Thomistic arguments for God), and it appears I have done the same for you! hope to discuss again soon. I'd like to hear your response to Lydia's questions, also. It sounded to me like you were saying that a belief that those who are not born again go to hell is an example of extreme fundamentalism (something you believe does not have Jesus at its heart, but is a servant of Satan). In my experience, when a believer tells an unbeliever "you must be born again" .. a quote from an Authoritative Source .. the lost person is not apt to report that discussion quite that way. It's more apt to be translated as "He says I'm going to hell". Kind of like the descriptions George Carlin used to give of Christianity. I therefore view the "reports of abuse" at the academy with some degree of skepticism, and acknowledge that lost cadets might well interpret an honest Gospel presentation that way. Unfortunately, there was something 'else' going on about five years ago at the AF Academy. It had nothing to do with honest Christian evangelization. It had to do with forced proselytyzing and also with overt anti-Semitism. If you want examples, you can research the work done by Mikey Weinstein whose two cadet sons were targeted. Mr. Weinstein served his country as Asst. Attorney General under Ronald Reagan. His sons were treated to some of the worst anti-Semitic behavior ever seen in the U.S. military cadet core. There is no room for lack of respect, forced proselytization, and abuse of those whose religions are 'not acceptable' to those who claim to be 'christian' evangelicals. My experience of committed Christian evangelicals is a positive one. I see Christ in them. They reflect the One they serve in the way that they treat others. My knowledge of abuses committed by anti-Semites and extremist fundamentalists leads me to think that they do not know the Lord Jesus Christ, and cannot have been truly 'reborn of water and of the Spirit'. There is a darkness present in them that speaks of following 'another master'. Essentially, if a cadet comes to see a chaplain on any military base, he is treated with respect and is helped. My own son has been counseled by a Protestant chaplain at the Petaluma USCG base in CA. The counseling involved a potential marriage engagement, and when the decision to proceed with marriage plans was made, the Protestant chaplain referred my son to a Catholic priest for the Cana counseling for marriage preparation. Total respect. Total Christian care was given. I am so grateful for the Protestant chaplain's assistance to my son. What causes people who think they are serving Christ to be so hateful sometimes, Bob? I can't understand that they don't know the harm that their behavior does to the Body of Christ. Am I wrong to think that they know they are hurting the cause of Christ? Or should I not judge them? I will respect your wisdom on this matter. When was the last time anyone actually read Article 17 of the Baptist Faith and Message? Either we believe in the first principle of liberty or we don't. Even God doesn't impose Himself onto people who don't want Him. It is not the place of government to show a Most Favored Faith, and that includes our own, lest one day that Most Favored Faith be that of Rome, Mecca or something else. I doubt we Baptists would be in favor of the government limiting our Baptist children the right to worship as they see fit in a military academy. We Baptists gave America the Separation of Church and State. It is up to us to safeguard it today.